In February 1958 a small band of enthusiasts met in the Two Brewers at Diss, under the Chairmanship of Rev Kenyon, to discuss the possible formation of a Rugby Club. Some had found the trek to Norwich for a home game too far, others had not played for years, and one or two wanted to learn the game. So a small committee was formed and a few fixtures tentatively arranged. The inaugural match was played in March 1958 against Norwich City College, who not only lent us shirts and entertained us most royally afterwards, but also lent us a player to make up the side, and then beat us well!!! The first home fixture was against a Norwich XV, an evening game played at the secondary modern school, now Diss High School, where we played for 3 seasons. 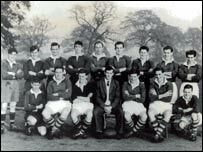 The 1958/59 season was the clubs first full season with Ned Cordingly (ex Old Albanians) the first Captain. Quite a few of the early members were involved in farming: Alston, Laurie, Gaze, Wyatt to name a few, so rugby did not usually start until October to allow the laggards to complete harvest and start drilling. The next pitch was on the Rectory meadow, slap in the centre of Diss, with changing facilities in a converted stable at the Saracens Head Pub. So when Gavin Alston and Barry Skipper formed the 2nd XV, the “Saracens” was an obvious name. In 1968 the club was offered a very favourable lease on the present ground by Mr & Mrs Mackender, who have been benefactors over the years. It was then two small fields woefully neglected and with a small wood with a pond in it, jutting into the field from where the gym now stands. An enormous amount of work by all the players (who were also committee members) saw it opened for playing with a match against a team raised by Dickie Jeeps of England and Eastern Counties. The first Club House, again built by the members, was two Romney Huts. This was soon expanded to three as the club now ran 5 senior teams, and Chris Wyatt and Norman Potter had by then got a thriving junior section started (due to his lack of playing ability). By 1982 the old Club House could no longer cope, so the present Club House was built and the ground purchased from the Mackender's, and the third team pitch was leased from the Seaman family, subsequently Harry Bowden. Practically the whole 1st XV in 2010 have come up through the Academy and several Juniors have played for England whilst Danny Hipkiss plays for England Seniors. There are in excess of 400 playing the game now, Social and Club Membership exceeds 400 people, both ladies and gentlemen and has always been renowned for good hospitality and teas. Come and try them at the weekend. Life Membership, Honorary Membership, Family Membership and Social Membership are in abundance as can be seen at many of our 1st XV fixtures and the hosting of County Games. Hosting RFU Regional Coaching days/weekends, a Pub Sevens each spring and a Coaching Officer linked with County Schools in Dave Hearndon-Hall with 15 schools being covered. There is a Club Annual Dinner each year on Maundy Thursday, sponsored match day lunches at home games and Annual Dinners for many of the parents in Junior Age Groups. After a successful 50th Anniversary Dinner when over £30,000 was raised the Clubhouse is now showing its age and fatigue. Renovation is necessary. Quite an impressive 52 years, from the eleven original enthusiasts, the club now has 4 Senior, 6 Junior, and a host of Mini sides not forgetting, in the mid 80's, 7 senior sides were fielded on 3 consecutive Saturdays. The dreaded leagues have cost us a lot of very social local fixtures against clubs who also ran 4 Senior sides, but we now play against larger and better clubs than we ever hoped for. Several of the Founder Members are still around, but now definitely in the Old Farts category.